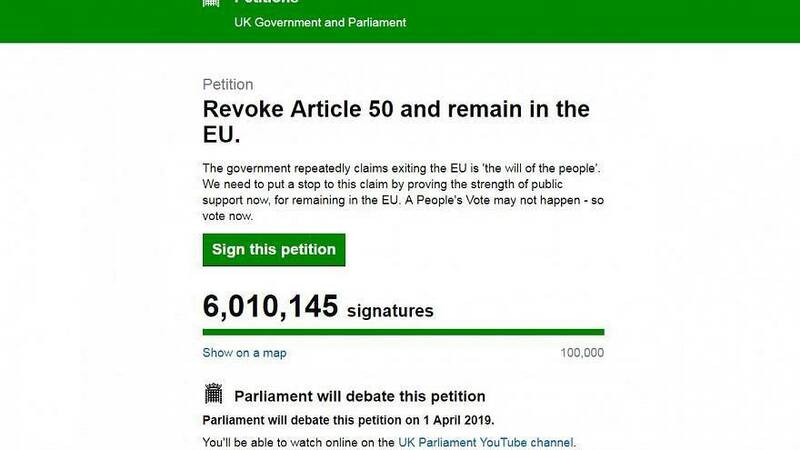 British lawmakers debated on Monday a petition asking the government to revoke Article 50 and cancel Brexit after it passed six million signatures on Sunday. The overwhelming majority of the MPs attending the debate represented constituencies that had voted against Brexit. Many made the case, not just to revoke Article 50 or hold a people's vote but more broadly to remain in the European Union. Scottish Labour MP Martin Whitfield said the EU was an organisation created to keep peace -- and it worked. "It was the right thing for young people then as it is right for young people now, " Whitfield said. He added that revoking Article 50 didn't mean the UK will never leave the EU, but that we can start to reconcile the country. Labour MP Catherine McKinnell slammed Tories for not taking part in the debate, pointing that the few conservative members attending got up and left before the beginning. "It's insulting to the members of the public who signed the petition," she said. "6 million people signed a petition to reverse the only policy the government has pursued in the past three years," said McKinnell. Responding to lawmakers, the government representative said the country must uphold the results of the referendum. "To hold a second referendum would be failing on the commitments we have made," he told a sceptical crowd. The petition was submitted by retired lecturer Margaret Anne Georgiadou on March 20. More than 100,000 people signed it in the first two hours of it being online. In parallel, Parliament is debating eight different non-binding Brexit options on Monday with the possibility of May bringing back her deal for a fourth time on Tuesday.